For newcomers: this post continues with my journey, currently in the north near Pai, on Tacomepai farmstay. Up today at 8.15am ish, there was no breakfast set out in the kitchen so I walked up to the house. Grandma was sitting out on the porch as normal, she motioned for me to go into the kitchen to collect the pot of rice (which is, I will explain, the same as yesterday, in a plastic tub like a wine cooler and then in a thin fabric bag within) and metal pot of red curry. The lady of the house (wife of the owner Sandot) was there, getting ready to leave for work in Pai. 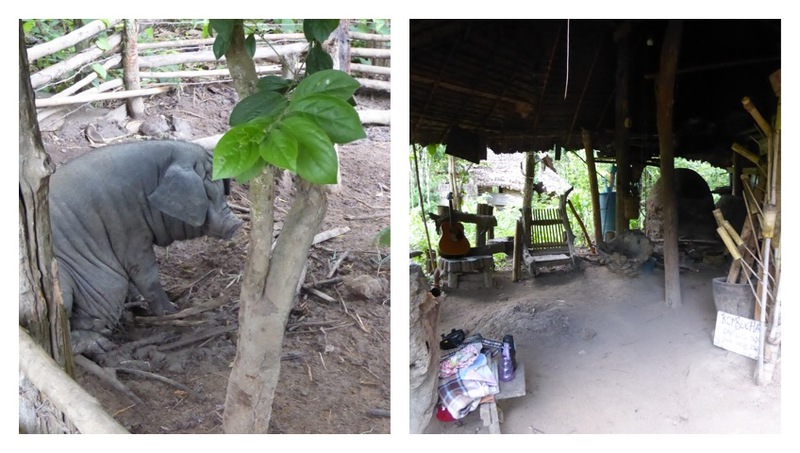 I took the food back to the kitchen and then after breakfast Jep (the name of the Thai man who I have seen around the farm several times, he showed me the huts on the first day, and he cooks all the food), came and showed me where we would be working. It took some miming but in the end he demonstrated the we would be clearing the field adjacent to the one I started (unfinished) yesterday. We used the same traditional tool which was hard work and after a while I noticed that the plants were so loose it was easier to pull them up by hand. I started to do this and after a while Jep did the same so it must have been a good idea. We dumped all the cleared bean plants over into the next field segment, (this field btw is one eighth or twelfth, I didn’t actually count, of one normal sized English field, so quite small for a farm really). The whole field is cut into retangle sections, declining, so that the water drains down the field and waters all the crops. I then followed Jep back up to the farmhouse, where we spent half an hour or so looking at seed. It was very confusing for me but I now know that this was rice seed. Now yesterday Carine (the French girl, another volunteer) was telling me about the problems with ‘bad seed’ and that the traditional Thai farmers don’t test the seed or select correctly. The method they use here, I discovered, is to toss the seed like a giant pancake in a shallow tray and then half the seeds fly out onto the floor. I think this is because the ‘lightest seeds’ the seeds with no insides will fly out. Problem is this doesn’t really work. I looked at the seed in the ground later and it was a 50/50 mix of dud empty seed cases and normal seed. But what do I know? I know nothing about agriculture. Anyway it was very funny to see them tossing the seed like this. Grandma did it too. Jep then got out an extension cable and plugged in a leaf blower and tipped it all out on the ground (on a tarp) and started blowing it away! This seemed crazy, maybe the tossing would have removed some empty seed cases but the leaf blower was more than strong enough to blow all the seeds alway. It certainly didn’t look like it was working very well. I helped him pour the seed that was left back into the bowl it came from and then he motioned for me to go for lunch. Then I had lunch and about 2pm Jep came and found me. First he showed me a plastic tub of live frogs which he proceeded to put into a bag poor things. Then we got in an very old truck that was parked in the drive. The glass was smashed and the truck was full of holes. It was the worst condition I have seen so far here. Probably because it was used for heavy and dirty work on the farm. The Songtheaws are normally in good cosmetic condition, maybe the Thai drivers have learnt that westerners won’t pay to get in old bangers. We drove about 10/15 minutes to a place which I think was owned by his parents or friends. An older man greeted Jep and proceeded to show him the trees in the orchard. Jep also gave him the bag of live frogs. We then sat on a bench for a while, waiting for somebody? This turned out to be a lady, around the same age as Jep, but it was hard for me to tell. After she arrived Jep led me to a large pond/small large, surrounded by a grassy bank. The bank was high and we sat on the edge and dangled our feet over. He gave me one with a reel to use but interestingly he fished with just a long stick and thread! She joined us shortly and she spoke some English, and again, she (like Grandma) didn’t understand much of my Thai, possibly due to the northern dialect being different to the south (where I learnt). She helped me set my line but I still didn’t catch anything. We crouched down on the bank and I told her where I had visited in Thailand etc. We used some kind of animal gut as bait, I’m not sure what. I had to carry the caught fish to the other side of the pond/small lake to where Jep had the net bag of fish. It was very wriggly and the lady found my attempts to hold onto it very funny. We, I say we, they, caught about eight fish between them and the fish was kept alive during fishing in a net bag hung under the water. On the walk back to the car Jep stopped in one of the orchard style areas in the farm, the trees were neatly in rows and motioned for me to help. We picked the fresh, smallest green leaves from about six trees. He said the leaves were ‘aroi’ อร่อย (delicious in Thai) and ‘gin’ กิน (eat in Thai) implying that we would be eating them? Back at the farmhouse (his friends farmhouse, not Tacomepai) the lady we had been fishing with offered me a Dragon Fruit, picked from a tree nearby. They had a wide range of fruit trees and bushes, but only one or two of each. Probably just to feed themselves, not being produced to sell. The dragon fruit is a lovely pinkish fruit the size of a large orange and it has wavy leafy bits on the outside like dragon scales. Inside it is white with tiny black seeds and is very sweet with not a lot of flavour. Very refreshing. She also offered me some water. She said ‘gin nam’ กินน้ำ which is ‘eat water’. A lot of Thai people don’t say ‘drink water’, ‘doom nam’ ดื่มน้ำ but ‘eat water’, ‘gin nam’ กินน้ำ. This is just part of the slack use of their own language. They also say ‘cow’ ขาว which means ‘rice’ instead of ‘gin’ กิน (eat) because rice is the staple food and if you are going to eat you most likely will be having ‘cow’ ขาว ‘rice’. After Jep drove us back to the farm we went to prepare dinner. I chopped the fish outside the kitchen. Out the back there was small stone veranda. I used a slice of a wooden stump as a chopping board. This involved chopping the heads and tails off, scraping the scales off and gutting them. But then only chopping them into chunks, not de-boning them. This is for ease of preparation but makes it really hard to eat the fish. This was frustrating for me as I like to shovel my food and not nit pick it but you really had to be careful with the bones. The fish guts where thrown to the chickens pecking about below the veranda. He put a couple of fish in the fridge for tomorrow and the rest he cooked in a stew with some vegetables. He gave me a plate which I took down to the kitchen to eat. With hindsight I think I may have been rather confused when we first got in the truck and went off, not knowing where we were going. On the other hand, that is what I would have expected to feel but I don’t remember being at all concerned and just went with it. I guess I have adapted to taking it as it comes. Especially when half the time you cannot commutate to ask what is actually happening. I don’t know what will happen to the frogs in the bag that we gave to the man on the other farm but I’m afraid that whatever their purpose is, they won’t live through it :(. While I was resting late afternoon, on the bench outside my hut, I heard some people talking. I got up and saws group of backpackers, complete with full bags, walking up my front path. There was a guy and two girls. They asked me if their friend was here? They said he arrived today. I knew there had been no new volunteers but I didn’t want to put them off so I asked how many nights he was supposed to be staying. They said just one, so I knew then they must have the wrong farm (there is a three night minimum at Tacomepai). I said I hadn’t seen any new volunteers today but that they were welcome to stay if they wanted and that we had just started planting the rice fields. Well I tried my best to get them to stay but it wasn’t very easy. Their friend wasn’t here and also it was hard to explain what ‘programs’ and ‘organised activities’ were running (there weren’t any..). There certainly needs to be some changes made around here if they want the volunteer program to continue? 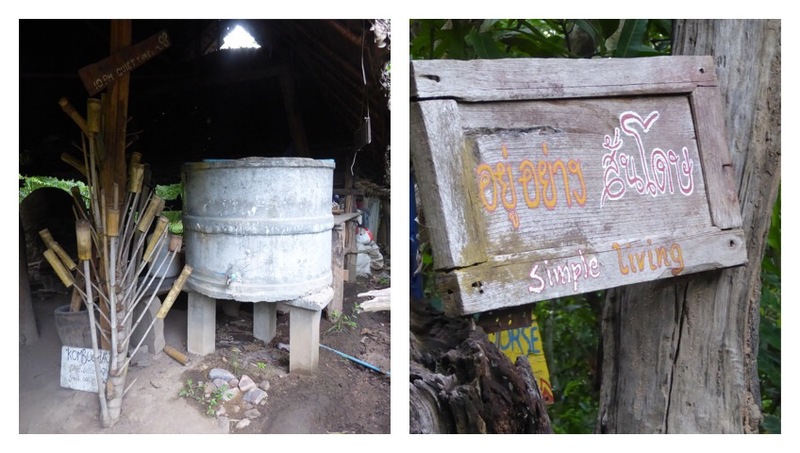 Sand water filter barrel and bamboo cups and one of the many eco promoting signs around the farm. Breakfast appeared on the table as normal and as no one was around, I spent a couple of hours peeling the bean pods. Jep came round with a petrol powered grass trimmer and was clearing the paths, which, being just dirt tracks, get overgrown with plants to the point that they completely disappear. After a bit he motioned for me to have a go. He taught me (all miming) how to work it. It had a string pull cord and was very simple. I cleared a few paths but I wasn’t very confident on it because, A it sometimes flicked up large stones that were amongst the plants and also B simply because I hadn’t had any training on it and I don’t think my insurance would cover it. It was backbreaking work, the engine was hung on a single strap over the shoulders and then from the engine there was a long pole and at the end the large trimmer blades. Carine said later when I spoke to her, that she thinks Jep doesn’t like using it because it is very uncomfortable. She explained that it is very hard to explain to him when she doesn’t want to do something because, for example, I couldn’t say in Thai, I have no insurance (I can now but this event happened weeks before I returned to the Thai school). Sometimes she has to say no to a task, but cannot explain why. Carine also said she knows the trimmer is ment to have a double shoulder strap and that one is much harder to use as it only has the one strap. Anyway I stopped after a while and went for a shower (it was hot work). I went for a walk out of the front of the farm and to the right. There was a good convenance store, locally run and I bought some bug spray, biscuits, some toilet rolls and an ice lolly! I walked past the farm in the other direction and ate my lolly. I bought a smoothy from a local food stand that was by the road. There didn’t seem to be much more that way within walking distance so I headed back. I sat in the ‘school room’ hut and used the Internet (the wifi was only available in that spot). I spent a hour or so trying to clear a bit of one of the field sections but gave up when it started to rain. That night there was a heavy storm right above us. I ate dinner and shelled beans in the kitchen in the dry and watched the rain, it was very peaceful being so far from any city’s or towns. During the night the white cat visited me and wanted me to let she her in but I didn’t want her climbing all over me so she had to sit outside, she wasn’t there in the morning. The organic waste disposal machine (the piggy) and another snap of the kitchen area. Next up: days forty-eight and forty-nine. Previously: update on my return home and how to support the blog. Previously: days forty-four and forty-five.